Sometimes soft skills in the world of employment seem like the alien life forms in conspiracy theory blogs: everyone is looking for them, everyone believes they exist and that they are the key to the future, but no-one knows exactly how to identify them clearly. So the issue remains an area open to speculation and opinions without any factual backing. Fortunately though, soft skills, unlike aliens, are definitely amongst us: they can be studied, and attempts can be made to define common methodologies to identify and measure them. There are now a lot of organisations focused on training or employment that are involved in just such activities. Since 2005, Bridge Partners® has been working to spread the culture of managerialism based on structured approaches and focusing on one particular soft skill: negotiating ability. Through observation of thousands of negotiations, Bridge Partners® has developed a scientific method, originating from the studies of negotiation processes carried out in the early 1970s by Gavin Kennedy, which first defines negotiating ability then nurtures it through training and verifies its effectiveness. Alessandra Colonna, Ceo of Bridge Partners® , ells us about the challenges involved when working in the field of soft skills. Does training and assessment of soft skills involve different challenges and complexities compared to those of training in technical or ability competencies? "The sociality which is a feature of our culture, has partly slowed down the more structured processes for codifying and developing competencies of managerial relations, which are often seen as a natural character or psychological trait. The current complexity of organisational contexts is bringing to light the weakness of this managerial model"
Nowadays, great importance is attributed to soft skills, also related to rapid change in technical domains. Has this awareness developed on all the levels involved: trainers, entrepreneurs, human resources specialists and learners, or are there still differences? In which of these categories would it be particularly necessary to take action? I believe that in general a certain importance is attributed in theory to soft skills, but I doubt whether this is then transformed into investments to support their development. I find it rather like the leopard who cannot change his spots: for cultural reasons our traditional family business, built up originally on the successful intuition of the founders and their eye for achieving things, still harbours considerable diffidence towards these issues. I have no wish to stigmatize this behaviour, I simply wish to point it out. From innate ability to acquired method: are soft skills in reality becoming new techniques to be applied? Of course they are. It is a question of awareness and, speaking in business terms, knowledge management. Soft skills can be coded, this is not a determinist approach, but simply an analytical one. Let me give an example. Take a company manager, appreciated for his or her ability to communicate or negotiate in an effective manner. If he or she does not understand, however, what behaviour comes into play in applying that ability, it will not be possible to pass it on to his or her colleagues. To mention just some of the negative effects: frustrated colleagues, loss of know-how and higher costs for the company itself, which will have to rely on outside resources to develop these competencies. Recognising soft skills: how soft can the consequent process of recognising and certifying soft skills be? Are ad hoc training courses required, or rather assessment opportunities independent from training, which can recognise the soft skills developed by individuals through their various experiences? If the training is of an experiential nature, as in our case, it becomes an effective accompaniment to awareness and therefore enables the individual to acquire the tools for self-assessment and, at the same time, for self-improvement. An external assessment would complete the evaluation process and reinforce its objectivity. The Open Badges are digital, precise (“micro”), verifiable certifications, that display clearly and simply the criteria on which they are issued. Which of these features has made them especially interesting for your operation? The Open Badges provide a simple and immediate way to bring to the attention of all the stakeholders those competencies acquired through a training process together with the content of that process. Easy, usable, simple, these are the three trump cards of the Open Badges for the benefit of the employment market itself, its players and mechanisms of employability. 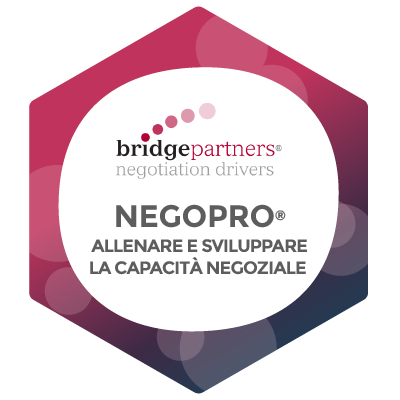 Take a look at Bridgepartners' NegoPro® - Training and developing negotiation skills Badge on Bestr.